Ah, Ft. Lauderdale. The name alone conjures up thoughts of sun, sand, and holiday fun. Today, this south Florida city located right on the Atlantic Ocean has grown into a wonderful beach getaway for the entire family with miles and miles of sparkling beaches, resorts, water sports, and great restaurants. With a tropical rainforest climate, it basically stays warm all-year-round making it a wonderful beach escape any time of the year. Warm your toes in the golden sands of Greater Fort Lauderdale's 23 miles of sun-kissed beaches - an easy walk from hotels, restaurants and activities. On a recent visit, I stayed at the idyllic Harbour Beach Marriott Resort and Spa, which has one of the largest private beaches in South Florida. Not only that — there were two pools (one just for adults — yay! ), a lovely spa, and great restaurants including a fun seaside bar with fresh seafood, salads and yes, frozen tropical umbrella drinks. Whether you like to sunbathe, tackle the waves with thrilling water sports, or visit beachside restaurants, there’s a Fort Lauderdale beach for you. Deerfield Beach is perfect for families, its cove like beaches offer a safe haven for kids to splash in the sea and create cool sand castles, whilst Ski Raven – on of America’s first cable water ski parks – offers a brilliant fun before heading to Deerfield Pier for a spot of fishing. For something a bit quieter, Hillsboro Beach is a quaint area with a beautiful lighthouse, and a fantastic place to see the turtle nesting, whilst Dania Beach is an unspoilt and uncrowded paradise, the Dania Beach Ocean Park offering a gorgeous pier where you can dine on freshly caught seafood. There is a ton of fun activities to do in Ft. Lauderdale besides spending the whole day lounging at the pool (which is fun too!). Kids of all ages will enjoy the Museum of Discovery & Science in downtown Fort Lauderdale – it holds over 200 excellent interactive exhibits that will get everyone excited, including live animal habitats and cool flight simulators. For the animal-lover, don't miss a visit to the unique Everglades and Flamingo Gardens – you’ll be sure to spot plenty of wildlife, including alligators, frogs, wading birds, and of course, flamingos! Nature lovers will also love wandering through Butterfly World, the world’s largest butterfly park that houses more than 20,000 live butterflies from all around the world, fluttering and swooping by at you stroll through the indoor rainforest. Take a cruise on the Waterboat Taxi on yacht-filled waterways lined by Mediterranean villas and mansions – there’s plenty of excellent waterfront restaurants and shops to dip in and out of, too. You could even hop on a Bluefoot Pirate Adventure cruise to float along the waterways – this small pirate ship is full of swash-buckling fun for the kids, with face painting, pirate costumes, and even water canyons. And of course, there are heaps of watersports to enjoy. From scuba diving, jet skiing, parasailing, boating and sport fishing, there is something for everyone. Try your hand at Stand Up Paddleboarding over at Aloha Watersports just in front of the Marriott Resort. It’s much easier to learn than surfing and you get a great core and arm workout. Plus when you get tired you can simply lie down on the board and make it your very own lounge raft. With more than 4,000 restaurants ranging from intimate cafes and al fresco waterfront dining spots, to quaint bistros, ethnic eateries and world-renowned steakhouses, you'll find something for everyone. Tree-lined Las Olas Boulevard is packed with tons of charming bistros, cheese shops, and boutiques and is a great place for a stroll – you could easily spend a whole day dipping in and out of innovative eateries for breakfast, lunch and dinner. There are restaurants of every kind, from the bold flavours at Outback Steakhouse-Pembroke Pines to the trendy, yet easy-going atmosphere at YOLO (You Only Live Once) – the tuna tartare there is to die for. Fancy trying out an all-American restaurant? The Floridian is a great choice for the whole family, its walls filled with photos of celebrity visitors and a traditionally American menu of large salads and hearty burgers. If you enjoy toasting the night with a cocktail or beer, there are plenty of trendy bars in this diverse city too, including flavourful brews and smooth jazz music at Blue Jeans Blues, and the hip, party vibe at Americas Backyard. 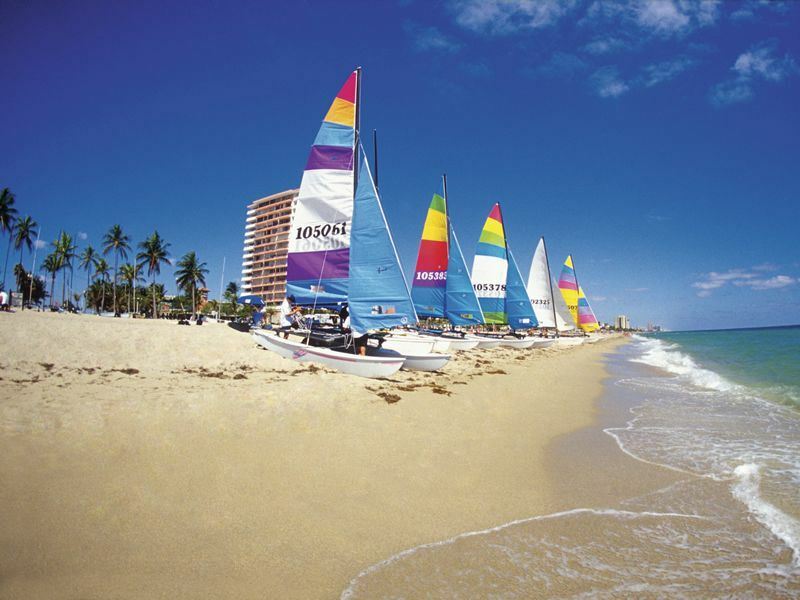 There is so much to do and see here, every visit to Ft. Lauderdale is a fresh taste of paradise.